Why would anyone use an anti-wrinkle cream? You knew when you got him that your shar pei was on the high maintenance side, especially regarding skin care. Yes, he does require more effort than dogs who aren't loaded with wrinkles, but that's part of his charm. Careful attention to his dermatological needs can prevent certain skin diseases. You might want to ask your vet to recommend a veterinary dermatologist familiar with the breed, or frequent a vet specializing in shar peis. This vet can recommend the right food for your dog, as skin health starts from the inside out. Shar peis are prone to food allergies which manifest themselves as skin issues, including hair loss, scratching and incessant foot chewing. This is the easy part, if your dog's skin is healthy. Your short-haired dog only needs weekly brushings and occasional baths, if he's truly dirty. However, if he has skin issues, there's more to do. He'll need more frequent brushing, but the frequency of special, medicated baths depends on the particular skin problem and your vet's instructions. Shar peis have two basic coat types recognized by the American Kennel Club: the harsh horse coat and the slightly longer brush coat. Mar Vista Animal Medical Center notes that a third coat type, the bear, is longer and such dogs are less prone to skin infections, but the AKC does not permit bear-coated shar peis to compete in the show ring. Wipe your dog's wrinkles out daily with baby wipes or a damp, soft cloth. Then thoroughly dry the wrinkles with a soft, dry cloth. This helps you avoid the condition called moldy wrinkle disease, which appears pretty much the way it sounds. He'll end up with infectious sores and rashes from bacteria and yeast. While you must keep his wrinkles clean and dry, don't oil them for soothing purposes. It only makes matters worse. Take your dog to the vet for treatment if he shows symptoms. 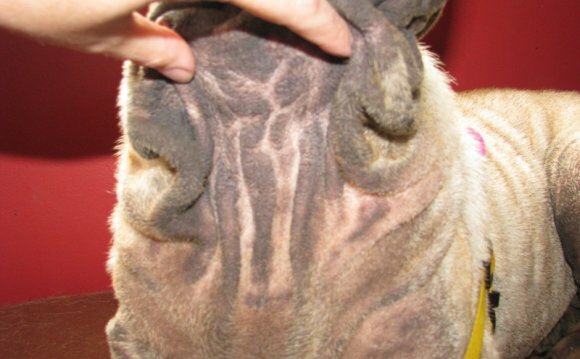 While all dogs need effective flea control, it's especially true for the shar pei. If your dog suffers from a flea allergy, he'll bite and chew at his skin, with inflammatory results. Ask your vet about the best flea and tick preventive for your dog and your part of the country. In some regions, you'll need flea prevention year-round.